Sing-along stories are the foundation of Little Bear Books Lake Tahoe. Krissi Russell’s engaging lyrics and music meet the beautiful illustrations of Lois Olsen in these sing-along book/CD sets. With each kids book/CD set, Little Bear Books strives to tell a story about nature that educates, inspires and entertains. Currently available are In The Meadow, a tale about the importance of not feeding bears and other wildlife, On The Trail, a sing-along story about hiking, trail etiquette and safety, and newly released No alimente a nuestros osos Don’t Feed Our Bears, a bilingual version of In The Meadow with a digital download of music included with book purchase. Kids nature books have never been so engaging. Read more about each Little Bear Book below, and click the audio links to listen to samples from Krissi’s popular sing-along stories. 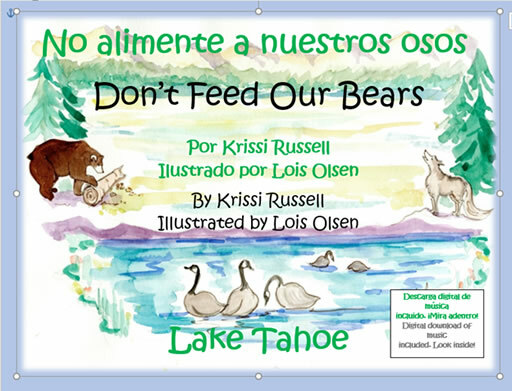 Krissi’s newest sing-along story is a bilingual version of her first book, In The Meadow (Don’t Feed Our Bears). 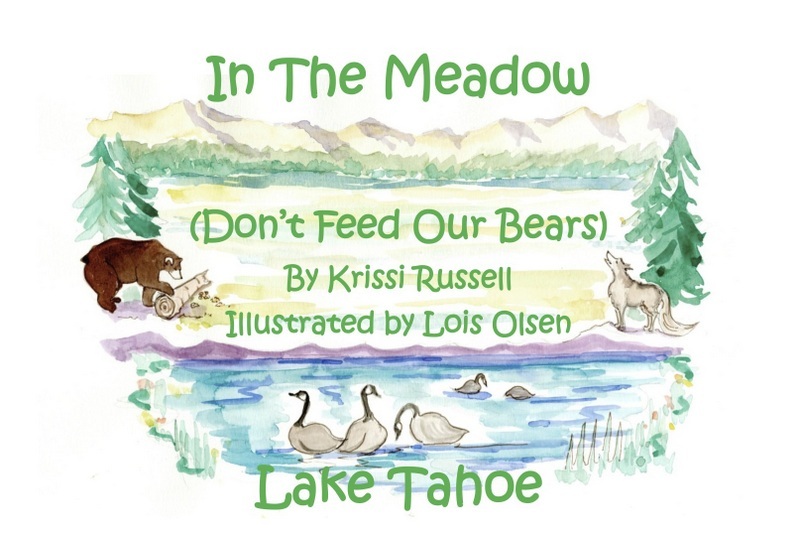 This book features the same beautiful full color illustrations, the same toe tapping melody, but two versions of the same musical message: Don’t feed our Tahoe wildlife. The 32-page soft cover book comes with a digital download of music in Spanish and English. Each page tells the story in both languages. It is a fun reminder to the young and young at heart to respect, appreciate, and protect wildlife. It makes a great Tahoe souvenir or gift for a young child. This Tahoe favorite is the cornerstone of Little Bear Books & Krissi’s first sing-along story for kids. Krissi harmonizes a true-to-life tale of living in the mountains, close to wild animals. Her lively music pared with beautiful illustrations by Lois Olsen makes this a big hit with young children. Learn about bears, coyotes and geese, and the importance of keeping wildlife wild. Don’t feed our bears! Sing-along CD included with book purchase. Music download also available. Listen to a sample from the book! **Don’t Feed Our Bears interactive K–3 Lesson Plans are available to accompany this sing-along set. Read more about Krissi’s Bear Lesson Plan here. NEW!! Krissi now has a watch & sing along movie available for download. Click here to get a sample. The sing-along story, On The Trail, is a fun way to teach hiking etiquette to young hikers. Engaging lyrics, upbeat music, and vibrant, full-color illustrations deliver a musical message: Stay on the trail. Leave no trace. Pack it in pack it out. Leave only footprints. Little Bear Books are interactive nature books for kids. Our sing-along stories elevate the traditional kids book. We tell a story about nature that’s entertaining yet educational so that children can hike, play and enjoy nature respectfully. Follow Krissi’s Blog for the latest releases and events at Little Bear Books Lake Tahoe. Click the PayPal sidebar link to purchase Krissi’s book/CD sets and interactive lesson plan through PayPal. OR SEND $12.95 for each book/CD set and $9.95 for the interactive lesson plan + $2.50 S&H to: Kristine Russell P.O. Box 7423 South Lake Tahoe, CA 96158. Wholesale prices available for bulk orders. Contact littlebearbooks@att.net.